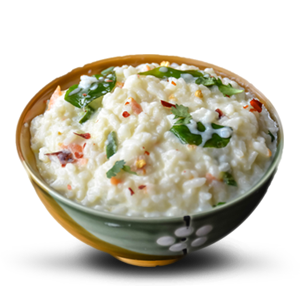 Curd rice also called yogurt rice is a dish of India. The word “curd” in India usually refers to unsweetened yogurt. It is very popular in the Indian states of Tamil Nadu, Karnataka, Andhra Pradesh and Kerala. It is seasoned with fried finely chopped green chillies, ginger, and curry leaves, and sometimes along with the tadka of urad dal, mustard seeds, cumin seeds, and asafoetida.